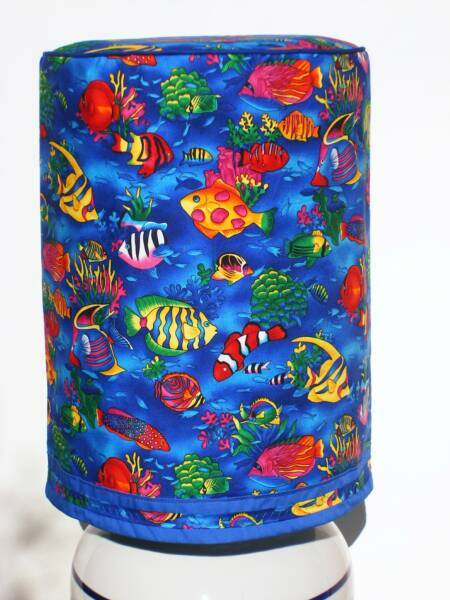 Decorative Water Bottle Covers for 5 Gallon Water Bottles–Seriously? I’m all for DIY home decor that is inexpensive and yields great results. But one decorating trend that leaves me scratching my head is this: decorative covers for 5 gallon water bottles. Really? Is a bottle of water so unsightly? I learned of this when looking over the search words that Google says led searchers to Square Pennies. It was happening so often that I had to find out what it was all about. That led me to this link. It seems to be an opportunity to add some color and fun to your room. It can be a little kitschy, but with the hundreds of fabrics out there you can probably find some you like. You can make a similar cover for small kitchen appliances or a sewing machine if you like. I don’t use those either, but they are supposed to keep dust out of the appliance. Start with something simple like a toaster and work up to bigger projects. These covers are pretty expensive to buy, and making them gives you the chance to choose your fabric and bias tape colors. Use the bias tape to cover all seams on the outside of the cover so that the inside is totally smooth with no seams showing. Those who want to avoid the $44 prices for the water bottle cover can make these covers themselves and save about $30. I don’t have a pattern, but it should be fairly easy. Just wrap a length of brown paper around the bottle & mark where you need to cut (allowing extra for seams. Then make a circle to cover the top. Take that to the fabric/craft store and have a piece of fabric cut that your paper pattern will fit on. Wash the fabric in hot water and dry on high to get most of the shrinkage out. Then iron the wrinkles out and cut the 2 pieces. First pin the long rectangle on the short sides with the right side of the fabric on the inside. Fit it on the water bottle pinning until it slips over the water bottle easily. With a pencil draw a straight sewing line on the wrong side of the fabric and sew together. Pinning right sides together easy the circle to fit the tube you just sewed. Use basting thread to stitch by hand this seam, removing the pins as you go. Then sew that seam on your sewing machine. Cut and pull out the basting thread. You can cover the raw fabric edge at the bottom of the cover with some coordinating bias tape from the fabric store. On the pictured cover they used bias tape on the bottom edge and about an inch above that for a little accent. Both are very easy to do and you would need just one package of bias tape for the whole project. Possibly those who want to make their own are looking for fabric that goes with their own taste. Possibly they don’t care for apples and daisies. I do kind of like the one at the link that is fish. Call me a snob, but I like the look of plain water. It’s relaxing. It’s tempting. All good things. But if you simply must make a cover for your water bottle, go for it. Enjoy it in good health! For all I know you are making something totally cool, like a pirate ship cover. Perhaps that would encourage your little buccaneers to drink more water! Have you seen these covers? Would you pay $44 for one? Could you make money selling these? If you can, more power to you! I have to use one because mine gets a bit too much light and will grow algae. It’s the only reason my family needs them. Indeed it does! I’m learning! Thanks Tom!